Heart shapes can be found in nature, if you’re lucky enough to spy one. There’s a heart on this elephant’s trunk, a ridge of skin that feels like fine shoe leather. One of his wrinkles pierces the lower third of this heart shape, from left to right, straight as an arrow. His real heart hangs between his breastbone and ribs, a little to the left, just like mine does. But instead of having a heart with a single point, an elephant’s heart has two points at its apex – so it’s the wrinkled outline of a human heart that he carries on his trunk. It’s designed to be strong, my heart. In mammals, birds, and reptiles the heart has the same basic pump-like design, a design that has worked through eons – even cold-blooded dinosaurs had hearts. A day or two after fertilization, embryos develop a pinpoint that pales, then brightens, pales, then brightens, the beginnings of a tiny pump practicing emptying, filling, emptying, refilling. An old, old pattern. The master timepiece. There are four chambers in my heart: two auricles (“little ears”) and two ventricles (“little bellies”) – named by anatomists for the external parts of the body they resemble. Spent, dark-red blood is collected in the right auricle, then dropped into the right ventricle, which constricts and pumps it out to the lungs to pick up oxygen. Bright red again, full of oxygen, blood circulates back to the left auricle and from there drops into the left ventricle. In the next twitch blood is delivered to every corner of my body. The “little ears,” the auricles, make very little sound as they drain blood into the lower chambers of my heart, a distance of an inch or so. It’s the ventricles, the “little bellies,” that boom as each contraction forces open heart valves and blood gushes up the aorta under pressure. Lupp DUPP. Lupp DUPP. Lupp DUPP. One beat smaller, one beat larger, flush after flush. My right ventricle has walls thin as paper – it delivers blood only as far as the lungs. If I could hold it up to the light I could see right through it. The left side of my heart is the heavyweight lifter, pumping blood all the way to my toes, moving 150,000 tons of blood in my lifetime. We each have roughly one billion heartbeats for our lives. Mouse, hummingbird, elephant, human, all the same. 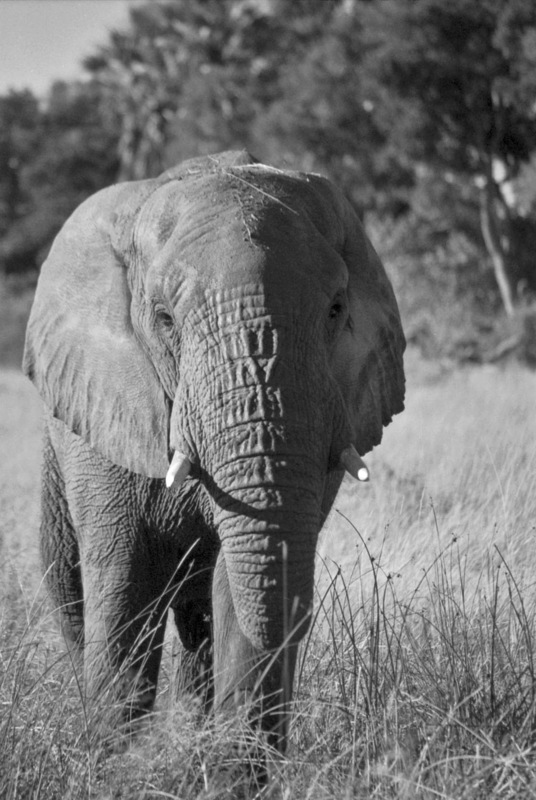 Like us, elephants suffer cardiovascular disease, die of heart attacks and strokes. Cardiac arrest: when the heart shudders and stops, when the light in the eyes flickers, fades and snuffs. is gone. The gurgle of digestion, all the silky, sturdy, slapping noises, the blood rush, gone. The symphony of the body is finished. For those of us left, that silence is almost too much to bear. Heart shapes can be found in nature, if you’re lucky enough to spy one. There’s a heart on Jabu’s trunk, a ridge of skin that feels like fine shoe leather. One of his wrinkles pierces the lower third of this heart shape, from left to right, straight as an arrow. His real heart hangs between his breastbone and ribs, a little to the left, just like mine does. But instead of having a heart with a single point, an elephant’s heart has two points at its apex – so it’s the wrinkled outline of a human heart that Jabu carries on his trunk. The length of Jabu’s real heart is about twenty-two inches, its width eighteen. His heart weighs around forty-four pounds, almost the same as a medium-sized dog. Still, it’s less than 1% of his body weight, a common proportion among large mammals and among humans. My heart also weighs less than 1% of my body weight: about ten ounces. Jabu’s great artery, the aorta, takes off from the left ventricle of his heart, the same as mine does. Named in the Middle Ages, aorta means, “to heave.” It’s an artery more flexible and sturdier than any manmade pipe. Jabu’s left ventricle pumps a continuous stream of blood up and out of his heart into the aorta, which then drops down into his chest and down each leg, where it branches and branches and branches all the way to his toes. Each arterial branch has less space than the artery it came from, but the sum of their volume is always greater than their mother artery. The blood moves, but more and more slowly through smaller and smaller pipes, trickling into all corners of Jabu’s body, trickling through capillaries one cell thick. Blood’s trip back to the heart is made through veins. Millions of tiny venules drain into thousands of small veins, thousands drain to hundreds, hundreds to the one that empties back into the heart. Veins are even more elastic than arteries, can hold variable quantities of blood, and serve as a reservoir for all that moving liquid. At any one moment, 65% of my blood is contained in my veins. It’s an ancient blueprint, this branching, this heartbeat, this coming and going, a blueprint brought to life in even the tiniest of creatures. Blood has to be literally hoisted from Jabu’s toes. Squeezed along by muscles wrapped around veins, pushed by valves in the veins, and sucked upward by the huge action of breathing, blood finally arrives in the vena cava, where it drops into the heart. Jabu has two vena cavae, possibly because of the large amounts of blood that need to be moved. The blood vessels of an African elephant reach lengths of twelve feet, a huge network of life. Jabu’s body contains 120 gallons of blood, enough to fill an aquarium six feet long, two feet wide and two feet deep. At one-and-a-half gallons, my puny amount of blood would barely fill a birdbath. Blood is the body’s only liquid organ, five times denser than water. It takes food and water in, removes waste and byproducts to the disposal areas of the body, the kidneys, lungs, and skin. Blood irrigates all tissue, both feeds and cleanses. It leaves the heart at one mile per hour and returns, laden with waste, at about half that speed. Construction materials move along highways of blood, demolished materials return. Blood is 20% solids and 80% water, carrying products of digestion, products made by the body, foreign intruders, the dust of stars, even cobalt from the original ocean of the earth where both of us, human and elephant, began our journeys. Before I fell in love with elephants, I went to Africa to see lions. Fed by documentaries and National Geographic, I wanted the excitement of watching lions hunting. I wanted tooth and claw and blood. I wanted my skin to crawl. We scuffed our feet. We’re sort of ready. Syd hefted the rifle from its rack on the dash of our Land Rover and my eyes followed this motion. I nodded to myself; the clenched spot in my chest relaxed a little. The lions of Kruger actively hunt humans. So far, a bullet into the ground at their feet has proven to be an effective deterrent. We followed the tracks into the bush. Bernardo took up the rear. “I am here to stop you from running,” he said with a small smile. Eight people marching in a line and stepping on each other’s heels are not easily identifiable as prey to a lion. But if I ran away from our group, I would trigger an instant hunting response: Look! Breakfast! And it’s fat and slow! I stepped literally in the lions’ tracks. They’re about three-fourths the length of my boots. And so fresh I could see where the claws have sunk into the sand and made deep slash marks at the front of their pads. I took a deep breath and tried to slow my pounding heart. Slowly we made our way through mixed scrub and across pockets of dry, withered grass, stopping frequently to listen for the calls of francolins and baboons, early-warning radar for lions. Syd picked up a handful of sand and let it fall through his fingers. A fluttering wind blew from the right direction, into our faces. If warned by our smell, the lions could decide to swing around behind and follow us. Bernardo kept glancing backwards, as do I, the last one but for him in our column. Even though it’s fall and many of the scrub thorns had lost their leaves, we couldn’t see very far behind or ahead. Syd and Bernardo occasionally conferred back and forth in low voices, speaking in Shangaan. I probably didn’t want to know what they were saying. Just beyond several deep gullies, the lions’ footprints disappeared into a thicket. Syd stopped and listened intently, then swept his arm to the right. We bypassed the thicket, perfect for ambush, and checked for lion prints on the other side. In an open, grassy area beyond, our line bumped to a halt. As if on cue, two heads popped up. The back of my brain started freezing. Apparently I had stopped breathing a long time ago. RUUNNNN! my brain yelled to my legs, but they were so far away they couldn’t make out what all the shouting was about. The lionesses were under trees on the far side of the field. They were lying down, but our invasion made them curious. They stared at us, open-mouthed. The whir of a camera reminded me that mine was dangling around my neck. 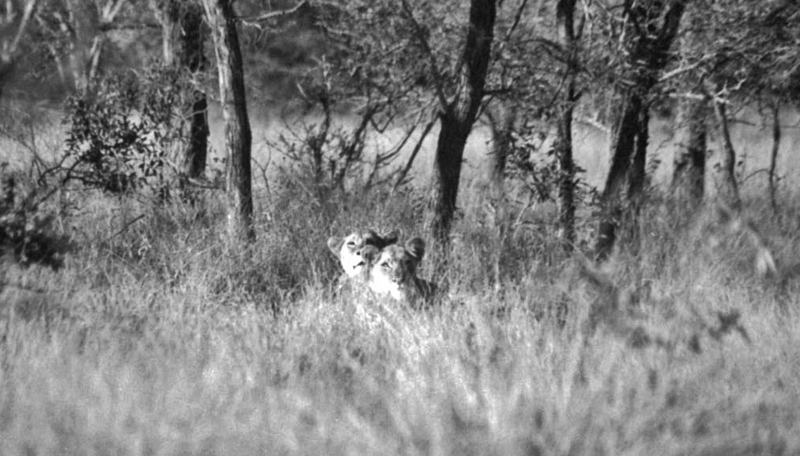 Through its telephoto the lions looked less dangerous, more relaxed, squinting at us. Then, off to the right, another lion roared. Syd’s eyes widened in surprise. A low “Tsssssss,” escaped between his teeth. There were more lions here than we saw tracks for. Everyone’s head, including those of the lionesses, swiveled in the direction of the roar. Even my hair follicles were listening. Almost simultaneously, a white bakkie, a mini-pickup, bounced into view near the lionesses and stopped. The woman driver surveyed the two with her binoculars and wrote something in a notebook. Bored with it all, the lions laid back down. Momentarily distracted from the fact that there were lions to the left and lions to the right, we asked Syd, “Who’s that?” Against all training, we’ve condensed into a tight ball around him. Even Bernardo moved up. The bakkie left the lions and rattled over the rough ground to us. “Morning,” the ecologist nodded to each one of us in slow motion. I wondered to myself if the lion that roared was moving in our direction. “Is it?” he said, “thanks.” Their exchange was so matter-of-fact it sounded as if they were discussing potholes. “Right then,” she said and the bakkie joggled off. Not even an offer of a lift. Bernardo led and Syd provided the rearguard. As soon as we expanded into a column, the lionesses’ heads popped up and followed our exit. We moved as one, marching in step, our spines expectant of fang and claw. As soon as we are out of view behind clusters of brush, Bernardo trotted off, and I was now in the lead, careful to back-track our own footprints. Soon we were in the Rover headed back to the clearing. The male hadn’t roared again. One of the lionesses opened her eye as we drove up, then shut it and flattened her ears. We were an annoyance to her afternoon nap but nothing to get excited about; not like whatever that strange beast was that just left. Syd told us that these sisters were the only survivors of a pride that once ruled this territory. Another pride recently moved in and killed all their relatives. That was the reason they didn’t answer the male lion. We were lucky; if they had answered, he would have come running. One of the sisters had a wound on her shoulder and hadn’t eaten while healing. Her ribs were showing. We watched the sisters nap. We’ve evolved from being possible prey to compassionate observers, all because we’re caged in a vehicle. “Will they make it?” one of us asked. “Do you feel sorry for them?” someone else added. 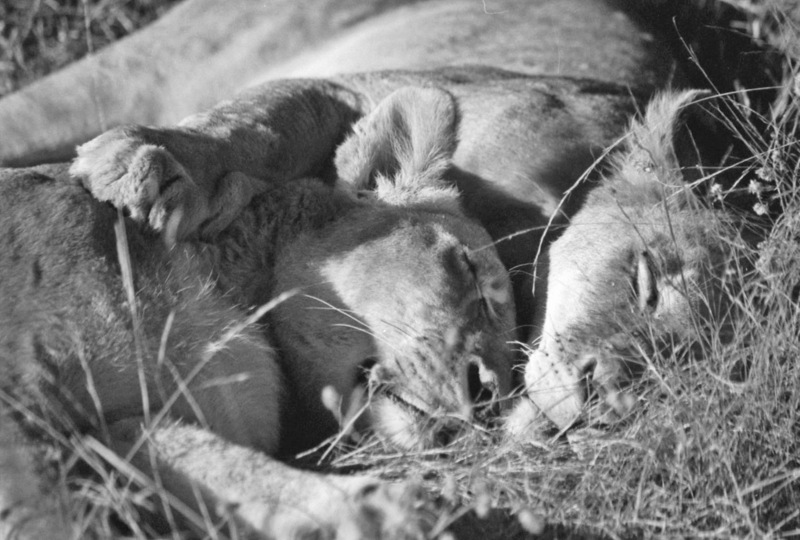 The lionesses napped side-by-side. Without opening her eyes the healthy one raised a front paw and draped it over her sister’s neck. No tooth, no claw, no blood. Funny, how, even in Africa, you always get something different than what you expect. The sun rises with spokes on her head like the Statue of Liberty. She rises into an immense lemon sky that almost turns green before it turns blue. She ignites the tops of trees with her torch. Bare, wood-muscular branches of a jackal-berry tree stretch above my head, tips ablaze with light. Crisp and clear, the air tastes of damp sage mixed with cold sand. Doug sets down his coffee cup and leaves to fetch the elephants. Skirting a tree-line filled with purple shadows, he crosses an open field of grass. Sandi and I wait, our hands wrapped around steaming cups. Half an hour later Doug returns. Jabu, Thembi and Morula are right behind him. Sandi whispers, “Let’s go, Jabu,” and he turns away to follows her down the dusty road in front of camp. 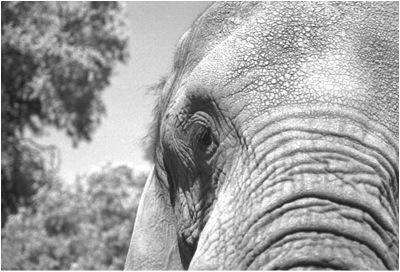 Plain-Jane Morula is next to saunter past, her broad, honest face etched with a network of creases and wrinkles, the tip of her trunk canted in my direction. Thembi lags behind, with Doug at her side, but soon catches up to Jabu, picking up a stick like he does, stashing it between her trunk and tusk like he does, dropping it just as soon as he does. The order in which they assemble never varies. First Jabu, then Morula, and finally Thembi. Yet, when we set off on our morning walks, it is always Morula, the oldest, who brings up the rear. 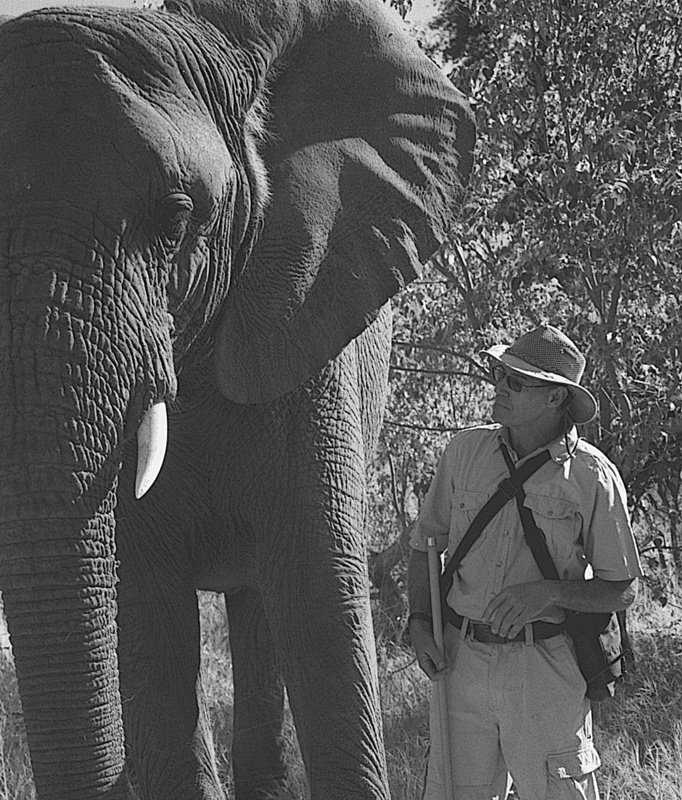 We mosey away from camp at a slow ramble, all in a line – Doug and Sandi, three elephants, and me. Yesterday I traveled by jet. Today I fall into place behind an elephant. My mind is having a hard time keeping up with a change greater than eight time zones and two hemispheres. I’m clumsy in this new world. The old discarded one of concrete and cell phones trails me like a lost dog. I kick at it, but it circles back to nip at my heels. It just won’t leave me alone. Tufts of grass nods gently in the wind of our passing. Isolated clumps of finger grass wave six-digit tassels at us. The fingers of a slight breeze hold my hair up to the sun. Morula stops, turns, and takes a single step toward me. Somehow she doubles in size. My heart leaps, captive within its ribs, desperate to flee. I know Morula is not wild, not truly. I know she has spent half her life with Doug and Sandi. Nevertheless, I’m paralyzed. I forget how to breathe. Everyone else is up near the front of the herd, as far away as another continent. Morula stands in half-profile, stares at me with one nut-brown eye. A feathery tuft of hair sticks out from her ear canal. Her mottled forehead glistens like cracked mud. Slowly she blinks her eyes, flaps her ears, and a lifetime later swings around to overtake Thembi. I exhale as they entwine trunks. Cicadas chirr, stirring up the morning. I stare down at huge round footprints in the dust. I look up; the elephants are receding. Last in line, I’ve been left behind. Wait for me! shouts every cell in my brain, as I scramble to catch up with the herd, take my allotted slot in the order of march. With a low throaty rumble MmmmRRRRRrrrrrr, his own elephant greeting, Doug slips under Thembi’s jaw and stands by her side. He reaches up and strokes the skin just in front of her ear. But her pose does not last long. She turns her attention to a pile of mopane branches. She picks up a single branch, strips its bark and stuffs the curled peelings into her mouth. Thembi is after the sweet, green inner bark of the smaller branches. Dessert first, the main course later.